TrustCentral’s technology may be used to support a variety of use cases stretching across variety of challenging needs within both commerce and government. Such security, authentication, trustworthiness, reputation and management challenges with IoT devices present a significant need for enhanced control and visibility to meet the needs of industrial enterprises, utilities, smart cities, manufactures (of products that incorporate IoT devices), governments, system integrators and others. 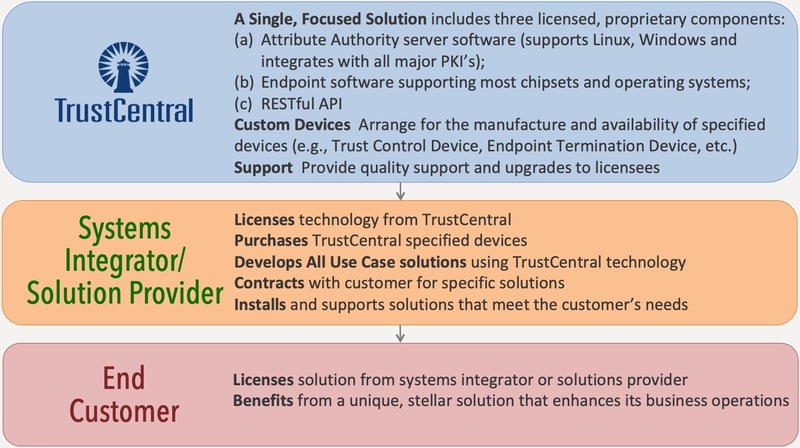 TrustCentral is focused on building and offering a single, comprehensive offering: an API that provides valuable and innovative capabilities and is supported by TrustCentral’s Attribute Authority and its IoT device endpoint application. TrustCentral aims to become “The Twilio* of authentication and secure of both IoT devices and their data by delivering a solution which is not only able to perform secure and measurably trustworthy services, but to also support private and trustworthy transaction and event records for enterprises and governments.” * Twilio is a highly successful company providing a robust API that supports sophisticated telephony resources for use by major businesses across the world.